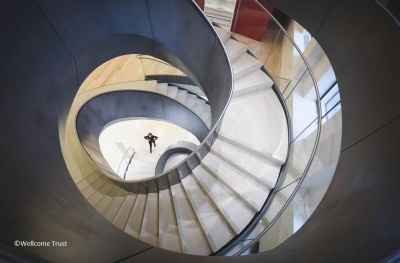 The Dynamic Stair is a key feature of the Wellcome Collection’s development project and the concept was to create a free-flowing form, travelling from floor to floor without any visually intrusive supports. 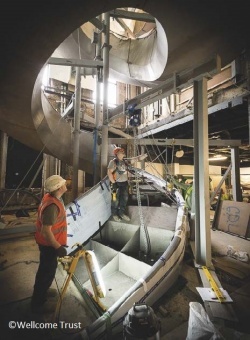 To install the stair the team was required to make significant alterations to the first and second floors, firstly introducing an opening to facilitate the stair’s insertion and then to provide the supporting steelwork to carry the stair loading back to the historic primary structure. Access below ground floor was not possible and so the strengthening of this floor or the vertical structure would be impossible. Hence, it became clear that steel was the only realistic option for the stair, exploiting the strength and stiffness of this material and its readiness to be worked into complex forms. For the stair itself, the chosen solution uses the inner balustrade and floor components as a structural monocoque that exploits every part of the stair as part of the structural system. This provides the vertical and torsional stiffness necessary to deliver the desired vibrational characteristics, and architectural aesthetic in an efficient and lightweight manner.